It has a 15 inch wingspan and is 5 inches tall when sitting on it's stand. 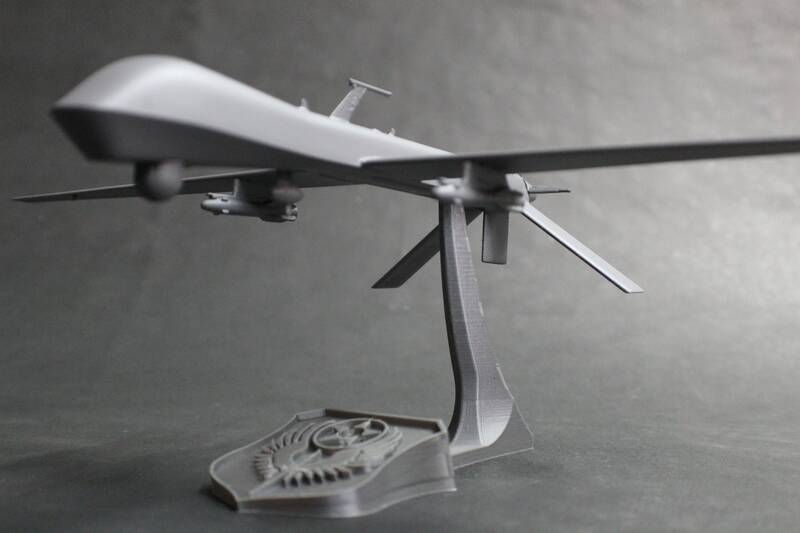 The stand has the USAF logo, and the model includes an imaging ball. The wings feature 2 pylons, with hellfire missiles. I like to leave the stand unfinished to prove that the model is indeed 3D printed. 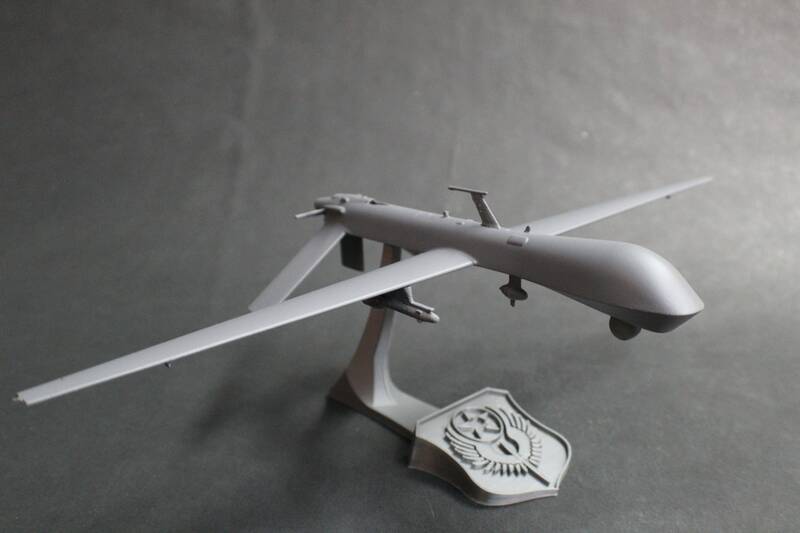 "The General Atomics MQ-1 Predator is an American unmanned aerial vehicle (UAV) built by General Atomics and used primarily by the United States Air Force (USAF) and Central Intelligence Agency (CIA). 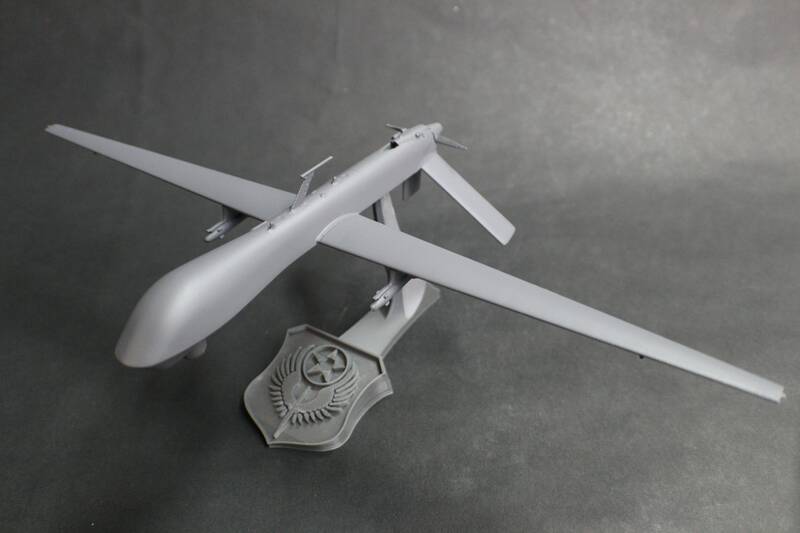 Initially conceived in the early 1990s for aerial reconnaissance and forward observation roles, the Predator carries cameras and other sensors but has been modified and upgraded to carry and fire two AGM-114 Hellfire missiles or other munitions. The aircraft, in use since 1995, has seen combat in war in Afghanistan, Pakistan, the NATO intervention in Bosnia, Serbia, Iraq War, Yemen, Libyan civil war, the intervention in Syria, and Somalia. 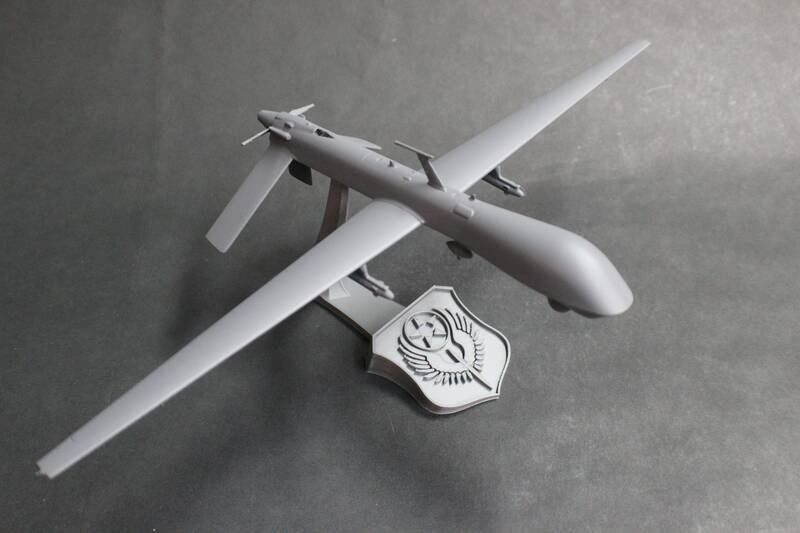 The USAF describes the Predator as a "Tier II" MALE UAS (medium-altitude, long-endurance unmanned aircraft system). 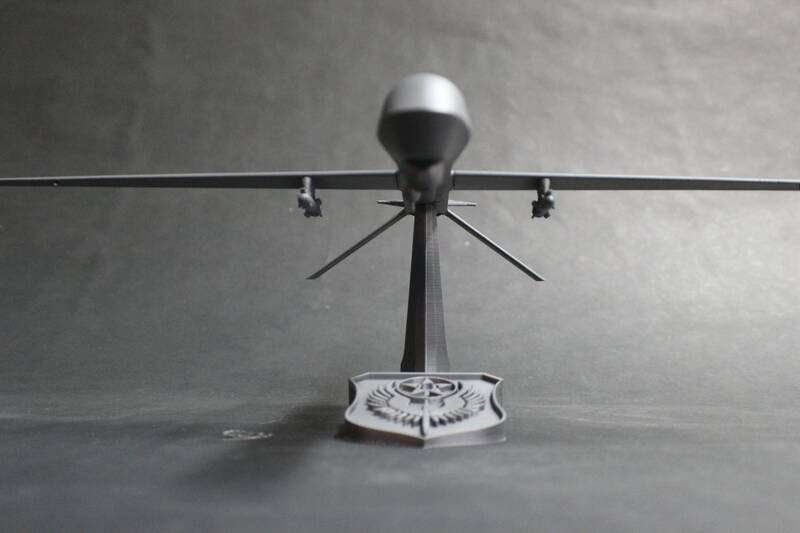 The UAS consists of four aircraft or "air vehicles" with sensors, a ground control station (GCS), and a primary satellite link communication suite. Powered by a Rotax engine and driven by a propeller, the air vehicle can fly up to 400 nmi (460 mi; 740 km) to a target, loiter overhead for 14 hours, then return to its base. 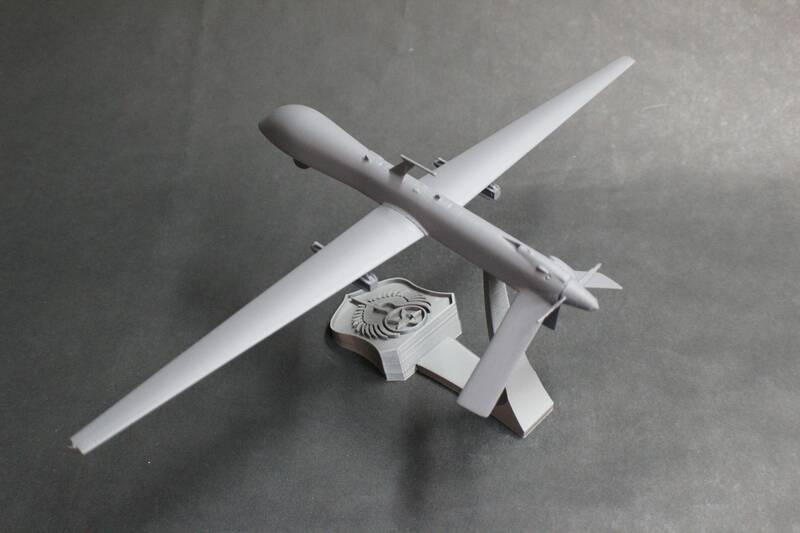 Following 2001, the RQ-1 Predator became the primary unmanned aircraft used for offensive operations by the USAF and the CIA in Afghanistan and the Pakistani tribal areas; it has also been deployed elsewhere. 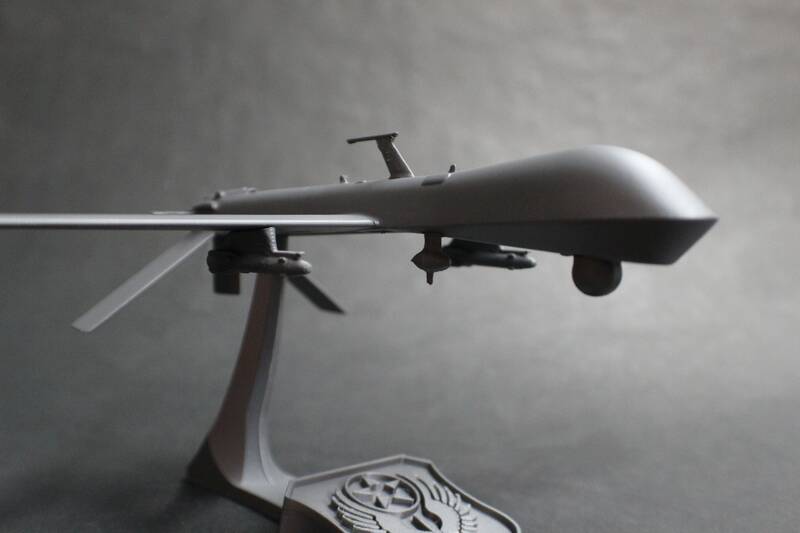 Because offensive uses of the Predator are classified by the US, U.S. military officials have reported an appreciation for the intelligence and reconnaissance-gathering abilities of UAVs but declined to publicly discuss their offensive use. Civilian applications have included border enforcement and scientific studies, and to monitor wind direction and other characteristics of large forest fires (such as the one that was used by the California Air National Guard in the August 2013 Rim Fire)." 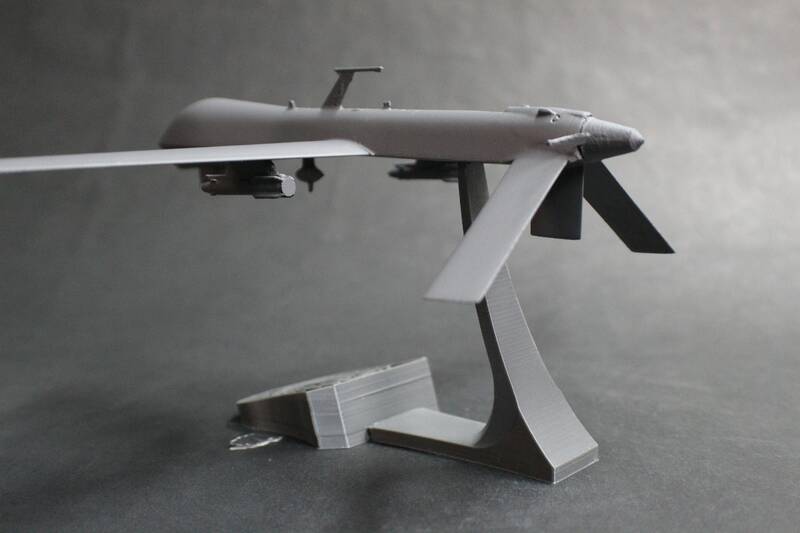 The wings are detachable, as is the UAV itself from the stand, to make for easier shipping and transport. 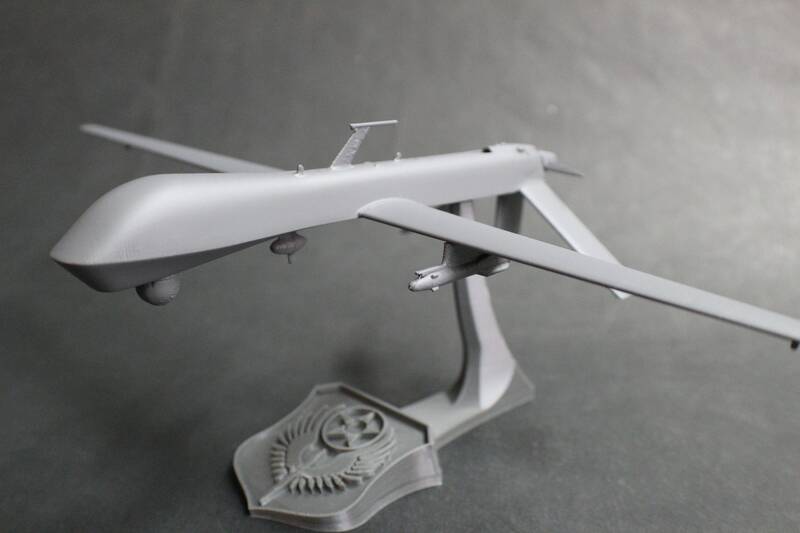 This specific model is printed, hand fitted and assembled, then hand-sanded, painted, and then wet-sanded prior to the finish coat. These take me a while to make, so I'll need a week to turn it out. 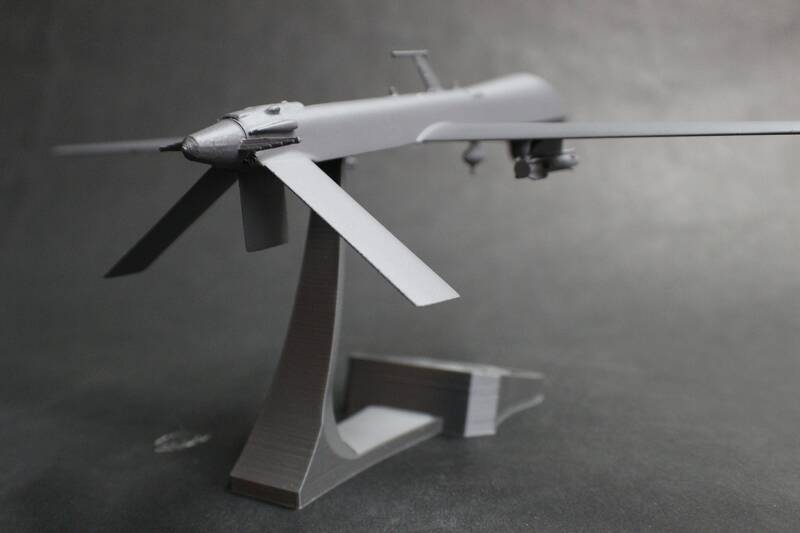 This is a 3D printed product, so there may be minor defects (rough edges, bumps, etc). As a result, every model will be a unique creation with a character all of it's own. I have spent months building my own machines to exact specifications for accuracy and surface quality, and I scrutinize every model very closely. I use only the highest quality filament to ensure colors are vibrant and defects are kept to an absolute minimum for both your item and my machine.